Anmerkungen Computer Space ist das erste Arcade-Videospiel überhaupt. Es basiert auf dem Videospiel Space War, welches 1962 am MIT für einen DEC-Großrechner entwickelt wurde. Das Fiberglas-Gehäuse gab es in den Farben gelb, weinrot, grün, blau und weiß. Später gab es noch eine Version für zwei Spieler, die sich etwa 1500 mal verkaufte. 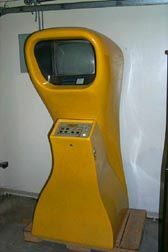 BEAUTIFUL SPACE-AGE CABINET attracts players of all age groups. The player is additionally attracted by two flying saucers moving about in formation on the playfield while the unit is in its non-activated state. EXCITING PLAYER ACTION occurs as coin is inserted and start button is pushed to activate the unit. A rocket ship appears out of nowhere and at the same instant the once friendliy flying saucer begins firing missiles at the rocket ship. Now at the controls of the rocket ship, you begin to evade the missiles bearing down on you and maneuver into position to fire your own missiles at the saucers. The thrust motos from your rocket ship, the rocket turning signals, the firing of your missiles and explosions fill the air with the sights and sounds of combat as you battle against the saucers with your missiles more times than they hit you for extended play in hyperspace. Attain hyperspace and the playfield turns white and gives you a vision of daylight in outer space. Thrill to the reality of controlling your own rocket shop in gravity-free outer space. Battle the saucers in a duel of wits and coordination!